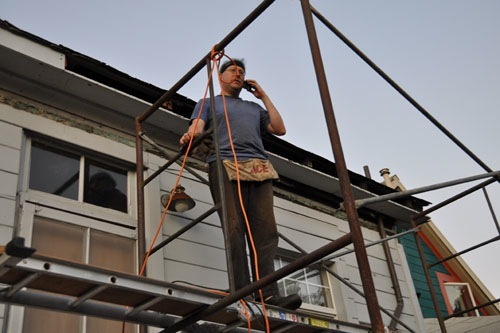 It was a nice day, and rain is forecast for sometime in the next 24 hours, so Noel went out to work on the eave reconstruction project a little more. The boards are all primed and painted, and they actually fit very nicely into place. 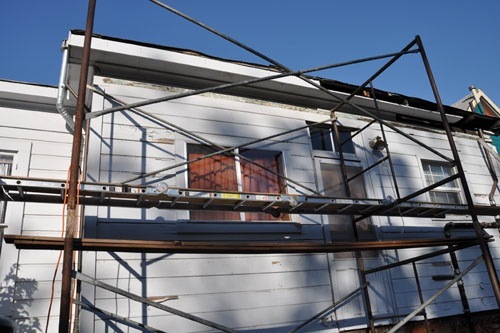 Once he finished the work on the left side, it was time to move the scaffolding over to the right to do the other side. We had to take advantage of the fact that our neighbors had their laundry room window open; the board we're using as a stage was just a little too long to move up easily without extending a couple inches into their house. 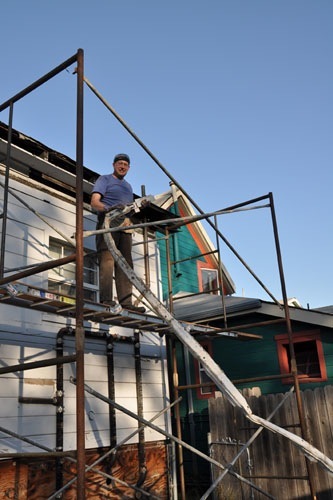 The moved scaffolding allowed Noel to pull down the last piece of the old aluminum awning. It had been wedged behind our bathroom vent pipes. That is the look of triumph, people. And that is the look of a guy being paged by work with a problem while up on the scaffolding. Also, speaking of moving scaffolding, on Tuesday the crews came and took the scaffolding down across the street. The front door and porch are not painted yet, but doesn't the rest look really nice? Though then the neighbors and I stood out in the setting sun tonight and discussed changing that uppermost band of dark colour for the body colour, because it is a little too heavy. That, or put some of the scrollwork that is above the first floor windows and on the edge of the porch up there to fill it in. I think it looks amazing. Jell-us. It took me awhile to figure out which section you mean. I'd go with the scroll work. I think the left side needs something for balance. Maybe that's what you mean by the porch not being painted yet? A little bit of darkness somewhere there. It's wonderful. Same as the comment above - It took a while to figure out which section you thought was too dark. I think it's beautiful & adding scroll work would make it even more so. 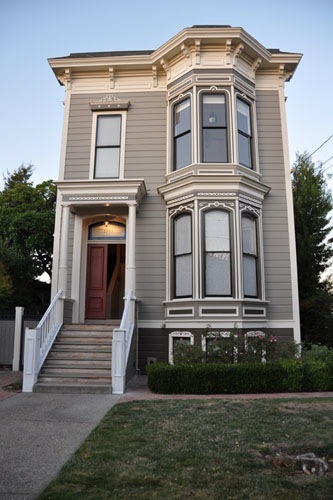 How about some trim around that window that's above the porch? Would there have been some there originally on the sides and bottom akin to the trim around the windows in the bay? Now that I'm staring at it, it looks slightly odd with just the top trim. The house across the street looks great. We're in Alameda and are looking paint....someday. Do you mind sharing their painters info.? I love the colors and agree that left side needs some "weight". Is there any evidance that there was a short railing on the porch roof. I have seen some houses similar to yours with wood/spindle railing or black iron rail. I think the wood rail with posts at corners would add weight and make window less bare. I've been playing with Paint. 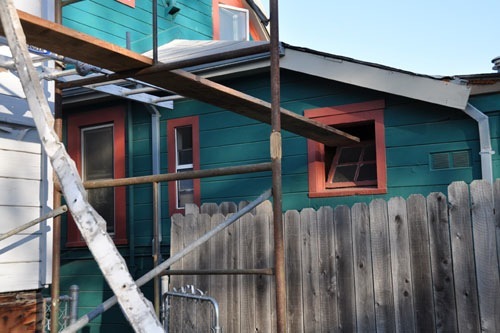 I like the idea of making that window over the porch look like one of the top windows of the bay, and changing the very top horizontal strip of wood on the porch top (is that what to call it...) to be the darker color that's almost lined up with it at the middle of the bay. Do they have a photo of the house as it was built? No early photos; the house was built shortly after ours, maybe 10 years later, as a mirror image. I need to show our neighbor all your comments; they will add lots of fodder to the evening paint discussions on the street. I went back and looked at your drawing of your house on the home page, because I don't recall a photo of the front. What does your window above your porch look like, it seems to have a more complex top than your neighbors'?